PARIS – March 27th 2018 – PORSCHE DESIGN and HUAWEI launch a highly sophisticated and powerful smartphone; the PORSCHE DESIGN HUAWEI Mate RS, at the opulent Grand Palais, Paris, France. Introducing the future of technology through features such as the world's first dual fingerprint design including an innovative in-screen fingerprint sensor, the world's first Artificial Intelligence (AI) processor¹ and Leica triple camera with 40MP image capture. This device will surpass the demands of even the most discerning smartphone user. Incorporating PORSCHE DESIGN's signature design language and HUAWEI's breakthrough technology and craftsmanship, the PORSCHE DESIGN HUAWEI Mate RS sets a new standard in mobile luxury. With a commitment to unique, functional design, the phone has a 6" 2K curved OLED screen and wonderfully symmetrical look, minimalist feel and a stylish 8-edged 3D curved glass body. Available globally in black² – a timeless colour that enables a seamless switch from glass to frame, and reflects PORSCHE DESIGN's commitment to purism and simple sophistication. The PORSCHE DESIGN HUAWEI Mate RS has been built with exceptional accuracy, meaning each component is there for a specific reason, and exactly where it needs to be to ensure the user gets the best possible experience in terms of power and aesthetics. High performance is also indicated in the naming of the smartphone: the term "RS" stands in the world of PORSCHE motorsport for outstanding racing performance. Each PORSCHE DESIGN HUAWEI Mate RS comes with a beautifully designed leather phone case accessory to match the lifestyle of the demanding target group. Cases are available in a range of leathers and colours, including black or red. Richard Yu, CEO HUAWEI Consumer Business Group said: "The PORSCHE DESIGN HUAWEI Mate RS is the perfect blend of today's most innovative smartphone technology and luxury design. We are bringing cutting-edge technologies to this device, which people will fall in love with - from the innovative in-screen fingerprint to the Leica triple camera system - bringing consumers an unprecedented experience." Jan Becker, CEO PORSCHE DESIGN Group, said: "Both PORSCHE DESIGN and HUAWEI seek to imagine and develop products that stand for precision and perfection, intelligent functionality and highly sophisticated design. Our aim was to create an outstanding device that goes one step further. We believe we have reached this goal by taking our partnership to the next level." 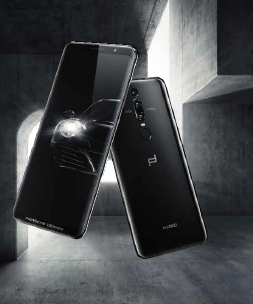 PORSCHE DESIGN and HUAWEI have worked in tandem to develop a smartphone that fuses together the two brands' DNA, wealth of experience in design and technology, industry-leading expertise and exceptional performance. Through the use of colour in the device's body, software themes and accessories, the new handset is accentuated with PORSCHE DESIGN's distinguished aesthetic and purist, minimalist feel. The PORSCHE DESIGN HUAWEI Mate RS will be available to purchase from premium retailers [insert local market examples] from April 2018.